Have you seen this image? I am sure you did, this is the famous celestial dancing posture "Ananda Thandava" of lord Siva having its roots in Natarajar Temple of Chidambaram. Temple is one of the panchbootha sthalam (five elements location) of lord Siva representing "Akasha" (Sky) manifestation. The Kalahasti temple at Srikalahasthi, where the Lord is worshiped in his manifestation as air/wind. This is the only place where Siva is worshiped in the form other than Lingam, though the swyambhu image found here is Lingam, rest of the image(Idols) are consecrated by erstwhile Raja's. Another uniqueness of this temple is, it houses Perumal(Lord Vishnu) Idol in his reclining repose as well, which make this temple at most reverence for both Vaishnavit and Saviat followers. Interestingly the tamil word "Kovil" (temple) for Siva refers to this temple and for Lord Vishnu it's Srirangam. "The story of Chidambaram begins with the legend of Lord Shiva strolling into the Thillai Vanam (Vanam meaning forest and thillai trees - botanical name Exocoeria agallocha, a species of mangrove trees - which currently grows in the Pichavaram wetlands near Chidambaram. The temple sculptures depicting the Thillai trees date back to the 2nd century CE). In the Thillai forests resided a group of saints or 'rishis' who believed in the supremacy of magic and that God can be controlled by rituals and 'mantras' or magical words. The Lord strolls in the forest with resplendent beauty and brilliance, assuming the form of 'Pitchatanadar', a simple mendicant seeking alms. He is followed by his Grace and consort who is Lord Vishnu as Mohini. The rishis and their wives are enchanted by the brilliance and the beauty of the handsome mendicant and his consort.On seeing their womenfolk enchanted, the rishis get enraged and invoke scores of 'serpents' (Sanskrit: Nāga) by performing magical rituals. The Lord as the mendicant lifts the serpents and dons them as ornaments on his matted locks, neck and waist. Further enraged, the rishis invoke a fierce tiger, which the Lord skins and dons as a shawl around his waist.Thoroughly frustrated, the rishis gather all their spiritual strength and invoke a powerful demon Muyalakan - a symbol of complete arrogance and ignorance. The Lord wearing a gentle smile, steps on the demon's back, immobilizes him and performs the Ánanda Thaandava (the dance of eternal bliss) and discloses his true form. The rishis surrender, realizing that this Lord is the truth and he is beyond magic and rituals." Chidambaram was our first halt, the temple lies just off the Chinnai-Nagapattinum highway (you need to skip the bypass and continue inside the city). This is the main entrance (left) and its not un-usaual to see pawnshops alongside the road. You across this gopuram to enter big open area with main shrine at the center. You cross the next entrance (right) to reach main Shrine. Image on left is what we have in Sanctum-Sanctorum, center gold plated idol is of Lord Siva in the form of Natrajar (in celestial dancing posture, its not a complete Natrajar posture as seen in the first pic top), on his left is his consort (Paravathi-Sivakami Amman) and on his right (i.e. 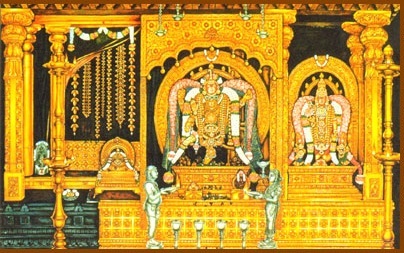 extreme left in the image) is the formless form of Lord Siva, since you can't see any formless image so it has the hanging golden Bilva leaves to give a visual look to devotees and reminding them the the presence of God in the space and it's permeates everywhere, this portion is covered by curtain and is opened to be viewed only for few seconds every after the aarti of main Idol (center one). Devotees wont be having a full view of this formless image directly but through the net like door having 108 square openings in it. This number 108 has some philosophical meanings which I will disclose shortly. Above pic is the gold plated gopuram of Sanctum-Sanctorum shot from the back side. Some philosophical facts as stated by one of the priest there. The 5 steps which reaches the podium of Sanctum-Sanctorum symbolizes syllables – "SI VA YA NA MA"
72000 golden nails used to pin the tiles represents number of naadis human body contains. 9 sacred Kalasam on the top symbolizes 9 forms of energy (or nav graha as some calls it). Some pics around this Shrine. As stated earlier one of the uniqueness of this temple is it houses Shrine of Lord Vishnu in reclining repose. This is one among the 108 Diya Deysams and is just in front of the Natrajar shrine on his right i.e if you are facing Natrajar then Vishnu's Shrine will be on your left, this Shrine is the extension of the main Siva's shrine in inverted L shape and thus one can see both the Idols. 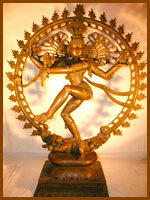 It is said that Lord Vishnu watch Lord Siva's celestial dance and thus facing this way. You walk opposite to Natrajar Shrine, and will reach the Kodi Maram or Dhwaja Stambh in the outer hall, adjacent to which is Nitya Sbhai, a very place where Lord Siva competed with Goddess Kali to establish his dance supremacy, its here where Siva wear earrings using his feet. Such as the remarkable feat which concludes his victory. There is a shrine opposite to Dhwaja Stambh to commemorate his victory, Idol there depicts the posture of Siva with one leg above his head. I must say this is an exemplary work of art and so intricate that it will make you glued to it. It seems this is recently polished. We offered our prayer, got a glimpse of formless form of Lord Siva and then moved to our next destination i.e. Thirukadayur. Not very far from Chennai, lies an old Murugan temple which houses the tallest statue(6 ft) of lord Murugan in Tamil Nadu, and is said to be 1200 yrs old. Situated 14km from Chennai in Kanchipuram district just off the state high way SH 57 (Sriperumbadur-Thirvallur) towards Sriperumbadhur. There lived a king name "Bhagirada" in this region, once upon a time Sri Narada paid a visit to this king ,only to get humiliated by him, which enraged Narada who in turn cursed him. While returning, Narada was greeted by a demon called Koran, who sought the blessing of Narada , he in turn asked the demon to defeat the king in retaliation as a result king was defeated and banished from his kingdom. Repented by his act he sought forgiveness and advice from Narada to gain his prosperity back. Narad directed him to saint Dhurvasa who adviced him to do fasting on fridays and worship Lord Muruga to appease him. His worship paid off, later the king got his kingdom back by defeating the demon. It is believed that this temple was built by the king. Its the Sanctum-Sanctorum which is 1200 years old built by the usual way of interlacing several monolithic mountain stones, its rather plain stones then the having intricate carvings. Later additional structures were built like surrounding walls and small shrines on each corner of the temple. The temple is well fortified by around 10 ft wall. A big temple water tank beautifies the front portion outside the premises which once is known for its divinity now stands desolated to be used by village peoples for washing clothes. Temple is run by the trust, despite that this hasn't received enough patronage which it is entitled to. There is no specific parking areas apart from the open surrounding for which they do charge Rs 10. Rajiv Ghandhi Memorial park, is just 9km further towards Sriperumbudur just off the NH 4 Highway, a must visit for to pay homage.